On 29 March 2008, the people of Zimbabwe went to the polls to vote in the parliamentary and presidential elections, and on the future of their impoverished country. There was world-wide interest in the elections and a great deal of media coverage. These elections were seen as crucial in determining whether President Robert Mugabe and his ruling ZANU-PF party would maintain their 28-year hold on power, or whether the opposition Movement for Democratic Change (MDC) would take their place. The elections were marred by violent clashes between the supporters of various parties and factions, and were carried out in an atmosphere of extreme tension. Official results began to trickle in on March 31. 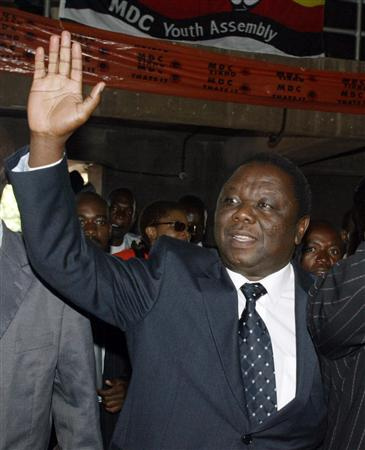 By April 2 all the results for the lower House of Assembly had been declared, with the majority faction of the MDC, led by Morgan Tsvangirai, winning 99 seats, Mugabe’s ZANU-PF winning 97, the minority MDC faction led by Arthur Mutambara winning 10 seats, and one independent. This was the first time since the end of white minority rule that Mugabe’s party had not held a majority, and it showed the level of dissatisfaction with him that exists in Zimbabwe. Zimbabwe is currently suffering an extreme economic crisis, and has been since the early 2000s, with chronic shortages in imported fuel and consumer goods. The inflation rate was 100,580% in January 2008, and continues to rise. Eighty percent of people lack jobs. The reasons for this situation are a combination of economic mismanagement on Mugabe’s part, and Western imperialist isolation of Zimbabwe. For example, under the “Zimbabwe Democracy and Economic Recovery Act” passed by the US Congress in 2001, Zimbabwe is unable to apply for loans and credit from institutions such as the IMF and the World Bank, and they refuse to cancel any of its debts. Whatever the exact reasons for Zimbabwe’s disastrous economy, it is clear that neither Mugabe nor the Western imperialist powers have the interests of the people of Zimbabwe at heart. After the unexpected success of the MDC in the 2000 elections, where they won 47% of the vote compared to 48.6% for ZANU-PF (which won 92.7% in 1996), Mugabe began a series of land seizures, kicking wealthy white farmers off the land and redistributing it amongst poor blacks. This was carried out badly, with little or no support being given to the new farmers, and as a result in many cases the new black owners simply went back to the cities and left the land to lie idle. As this issue of The Spark goes to press, the results of the presidential election have still not been released, although the MDC’s Morgan Tsvangirai has declared victory. The government has also ordered a recount of the parliamentary results, stirring fears that the results will be rigged in ZANU-PF’S favour. Robert Mugabe is a brutal and corrupt dictator, and has fulfilled few of the promises that brought him into power following the liberation war. But the MDC, which was founded by the trade union movement, has increasingly adopted neo-liberal economic policies in order to try and secure Western support, and has called on the US and the UK to “intervene” in order to “break Mugabe’s white-knuckle grip on power”. It is obvious that an MDC government would be no more friendly towards the workers and peasants of Zimbabwe than the current regime. The working masses of Zimbabwe need a genuine revolutionary socialist party to overthrow the neo-colonial capitalist system that is the ultimate source of their country’s troubles. « Who got the new minimum wage rise?